One of the strongest Skylake overclocking motherboards out there. But what a price tag! Rear I/O: 4x USB 3.0, 3x USB 3.1 Type A, 1x USB 3.1 Type C/Thunderbolt 3, Gigabit Ethernet, 5.1 Audio, Optical Out, 802.11ac, PS/2 Combi Port. Let's get this out of the way: this motherboard is for serious overclockers. For the inexperienced, overclocking can be a quick and easy way to fry your hardware faster than you can find the words "Darude” and “Sandstorm" on Twitch. This board isn't for you. If you are into dancing around the fiery crucible of Hz-inducing madness, and are searching for one of, if not the best, overclocking boards out there, then Asus's line of RoG Extreme motherboards should always be one of your first ports of call. The Extreme is no different. Whenever I'm testing motherboards, there's generally one benchmark I always try to reach first: hitting the 4.8 GHz mark. If you’ve heard any of the hullabaloo surrounding Skylake, you’ll more than likely be aware of the rumours of a return to the “good old days” of overclocking, aka Sandy Bridge. It was supposedly going to be easy for us to, once again, rattle the cages of 5 GHz on our way to the top of silicon greatness. It was a glorious dream, and one that never became a reality. With our particular CPU we found that no matter what we tried, we could not get the mighty Intel Core i7-6700K past that 4.8 GHz barrier. That being said, the sample I received ironically was one of the better of the lot, as some of my colleagues, friends, and associates didn't even manage that. In every motherboard review I've done for Skylake so far, I've only ever managed to reach a stable 4.8 GHz overclock, certainly a far cry off the 5 GHz plus marks we were seeing from Asus and Intel prior to Skylake's emergence into the real world. Although that’s not entirely unexpected, as let's face it, they do have the crème de la crème when it comes to hardware access. If I could throw this motherboard under water... 5.2GHz? Maybe more? Owf. At this point you can see where this is going. Yes, Asus's Maximus VIII Extreme motherboard cracked that silicon barrier. With relative ease, too. With a bit of TLC it managed to achieve a grand overclock of 4.95 GHz. That may not sound like a large increase when you consider the price of this behemoth of a board. But ironically, it wasn't a limitation with the hardware that stopped us grabbing that 5 GHz mark, but actually thermal throttling impeding our way. Throughout all these tests I use an NZXT Kraken X61, arguably one of the most powerful AIO coolers out there at the moment. Yet the 14nm core began to thermally throttle itself just shy of 5GHz, and the more we lowered the voltages, the less stable the CPU became. If I’d had time to throw this motherboard under water, we can only dream. 5.2GHz? Maybe more? Owf. Ultimately there's two easy ways you can tweak this board. Firstly, you can jump into the BIOS, switch on the XMP profile, and change the TPU Setting from I to II. This ensures the motherboard is aware that it's being cooled by either a closed loop or a full water-cooling setup. At which point it’ll benchmark itself and adjust the multiplier and voltages accordingly. Then there's the second method, which utilises Asus's '5 Way Optimisation' software. Buried deep in the heart of 'AI Tweak,' this will optimize every part of your system, from fan speed, to CPU frequency, to voltages, all in an effort to give you more performance for free. What you can expect from both of these methods is outstanding. The TPU change alone increased the base overclock by 0.4 GHz, raising our CPU frequency from 4.2 GHz to 4.6 GHz. Not too shabby for an everyday overclock. What is a little more terrifying is what happens when you let the 5 Way Optimization software do it's thing. In our testing it managed to achieve a stable 4.85 GHz overclock on our CPU. Essentially a piece of coding slapped my previous overclock records in the face on this motherboard, without so much as a bead of sweat dropping off our little Skylake chip, and in 1/10th the time it took me to achieve those wonders prior too. What else does $500 (£330) buy you? So we’ve established that yes, it’s good at overclocking. Alert the press, Extreme motherboard can break records. But what else does $500 (£330) buy you? Beyond the microfine alloy chokes, 10K black metallic capacitors, and fancy custom mosFET solutions, when it comes down to it, there's not a huge disparity between this board and the Maximus VIII Hero. The audio solution is identical to that of the Extreme's younger brother. I’ll admit that doesn’t seem impressive for a motherboard this expensive, but when you consider what it is both these prodigal sons carry in terms of an audio arsenal, you might want to reconsider that thought. Asus's SupremeFX 2015 consists of a shielded Codec, an ESS ES9023 DAC, dedicated clock generator, Japanese caps, 2Vrms amps, auto impedance sensing, a dedicated de-pop relay, all working merrily alongside Asus’s Sonic Studio II software. We're talking at least £50s worth of audio hardware just on board the PCB alone. Unless you're running an external DAC or sound card, you're not going to find much better in terms of integrated audio, short of MSI's Z170A Gaming M9 ACK. But even then, comparing these two boards together (although both being at the high end of each manufacturer's arsenals), is like comparing Battlefield to World of Warcraft: both specialise in two very different fields. The M9 is an audio lover’s dream, whilst the Extreme is by far, the superior overclocking MoBo. And with the same audio inventory of the prestigious Maximus VIII Hero, it’s hardly like you're being short-changed here. As far as additional hardware support goes, you have access to eight SATA 6Gb/s connectors, two SATA Express connectors, one M.2 socket (allowing data transfer speeds of up to 32 Gb/s) and one of Intel's new U.2 connection standards (think M.2 speeds in the traditional 2.5" SSD form factor). And of course a plethora of internal USB 2.0 and 3.0 headers. An interesting feature we're starting to see on all of Asus's motherboards is the inclusion of a dedicated AIO water cooling pump fan header. This provides a constant and solid output for any water pumps you might have in your system. On top of that you also net yourself a nifty fan extension card and an additional 7 PWM fan headers across the motherboard. So cooling is fairly solid, although if you’re trying to build a super clean system, I’d still advise you to invest in a dedicated fan hub, regardless of how impressive Asus’s Fan Xpert tech is. I could sit here and reel off a list of specs as long as my arm: there's WiFi AC up to 1300Mb/s, there's Intel's Thunderbolt 3 utilising the USB 3.1 Type C form factor, there's a snazzy OC Panel that acts as either a standalone or a dedicated 5.25" drive bay panel, helping you monitor and overclock your motherboard without entering BIOS. And even a right angled USB 3.0 internal header, (thank you Jesus!) So yes, you do get a lot for your money's worth. If you're looking for the absolute best Z170 overclocking motherboard... this is for you. That being said, we still arrive at the same big old problem problem. The price. You just can't get away from the fact that it's a whopping £330 in the UK and $500 in the US, and no matter how you look at it, that's one hell of an entry barrier. 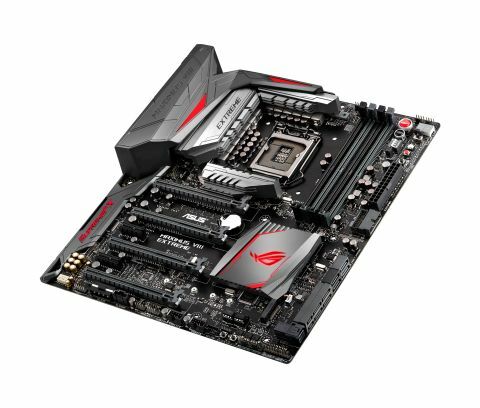 This motherboard has been designed to include everything Asus has to offer. It's the pinnacle of motherboard technology, yet whether that's worth it for you is another thing entirely. Despite the exhaustive list of features, the Extreme still has its flaws. Even for that cost you lose out on the ability to run four dedicated graphics cards, as the Maximus VIII Extreme only has three PCIe 3.0 x16 slots. If you want to run four way SLI or CrossFire, you'll need to move to the X99 platform. There's no second M.2 slot either, which would have been nice to see on such a premium motherboard, allowing easy RAID 0 configuration. This is no doubt in part to the inclusion of U.2, but again considering how uncommon those devices are right now, that's a storage interconnect that certainly feels closer to the likes of SATA Express and its ilk, rather than a new connection standard taking the world by storm. Is this motherboard worth the extra cash? You do get a stunning software setup, but that's nothing we haven't seen from the Maximus VIII Hero, Impact or Gene before now. You get the same UEFI BIOS, AI Tweak, RAM Cache, Sonic Studio and 5 Way Optimisation software that you get from all of Asus's RoG lineup, and you get the same audio solution as the Hero. If you're looking for the absolute best Z170 overclocking motherboard, and price is no object, this board is for you. It's very good at what it does. If you prioritize gaming over high-end overclocking but are still looking to throw some voltage around on your powerhouse Skylake processor, it's likely more money than you should be spending. The Asus Maximus VIII Hero is probably your best bet. All benchmarks are performed using an Intel Core i7-6700K, 16GB of Crucial Ballistix Elite DDR4 @2400 Mhz, an Nvidia Geforce GTX 980, and a 512GB Samsung 850 Evo.